For its size, Goodyear Heights has more open and public park land than any other neighborhood in the city. From the small neighborhood parks found scattered around the Historic District, to popular Reservoir Park located at its center, and on to the many acres of meadows and forests found in Goodyear Heights Metropolitan Park, The Heights has an abundance of green open spaces ready to enjoy. 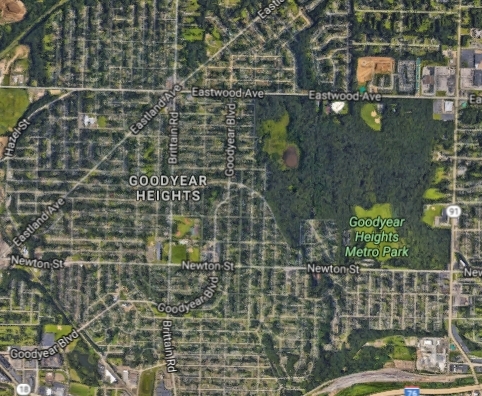 Goodyear Heights was originally envisioned as a “garden city” – and its creator, landscape architect Warren Manning, used these design principles as he laid out the neighborhoods streets and open spaces. This approach called for houses to be placed on lots that were large enough to avoid the appearance of overcrowding, allowing natural features to be preserved, and designing to create an atmosphere that eased the stresses of everyday work life. 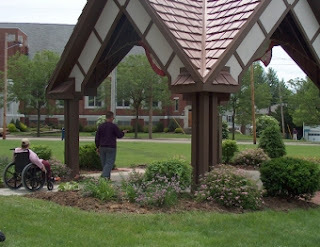 Streets followed the natural contours of the land…stately trees were left untouched where possible…and open spaces were set aside as small “pocket parks.” Around the “village green” at Goodyear Boulevard and Pioneer Streets, the restored rose garden and gazebo beckon you to sit down for a moment and relax. The shelter house at Reservoir Park is a rustic WPA-era building that was enlarged in the 1980's. Combined with the neighborhood’s shady streets, scenic walking paths, and broad views over the city, the parks of Goodyear Heights offer a wide range of recreational amenities that can be enjoyed year round. Runners, hikers, bicyclists, nature lovers, sledders, skaters and fishermen can take advantage of the Metropolitan Park’s many features, and athletes of all ages can be found at Reservoir Park’s baseball diamonds, tennis courts, Frisbee golf course and public swimming pool. An overhead view of Goodyear Heights makes it clear why its a great spot for those who love parks and green spaces.